Dr. Arnold Horowitz, DPM, a board certified foot & ankle specialist, would like to welcome you to our practice. 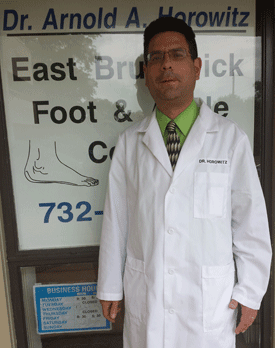 We are a comprehensive podiatry office located in East Brunswick. We provide excellent podiatric care to our patients in a comfortable, friendly and relaxing environment. Our state-of-the-art office is equipped with the most modern diagnostic equipment and Dr. Horowitz has the experience to treat all of your foot care needs. At our office, we specialize in routine nail care and surgery, custom foot orthotics, and diabetic foot care. Many of our treatments can be accomplished through minimally invasive procedures emphasizing early return to work and sports. By accepting most insurance plans and offering convenient office hours, we are able to treat many patients from all over the areas surrounding East Brunswick. Let us take care of your feet! Great podiatrist whom is very thorough and caring! I would recommend him to anyone with any foot/ankle problems. Excellent, solved my issue in one visit. Front office staff was professional and efficient. © Podiatrist Website Design All Rights Reserved.